So... fun story. I'm kind of obsessed with the *idea of bullet journaling at the moment. I've always wanted to start my own bullet journal buuuut I've had a few obstacles standing in my way. J O U R N A L S, etc. B - The mother of all bullet journals aka the ~Leuchtturm~ is not cheap (and honey I'm about that spending as little money as humanly possible life). and C - Bullet journals are daunting. They require some sort of art ability because, if you're like me, you want them to look aesthetically pleasing. They're a killer to set up because you're pretty much free-handing everything. But above all bullet journals are just flat-out time consuming. They require a lot of attention and, gurl, I don't have that much attention to give. (School is a killer). 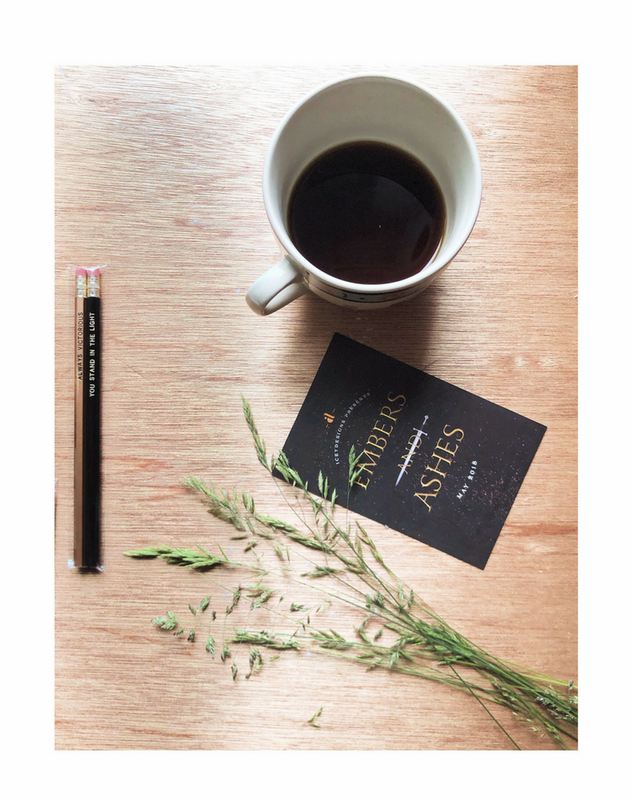 However, I've recently had all of my former obstacles removed from my path. Well, at least for the most part. 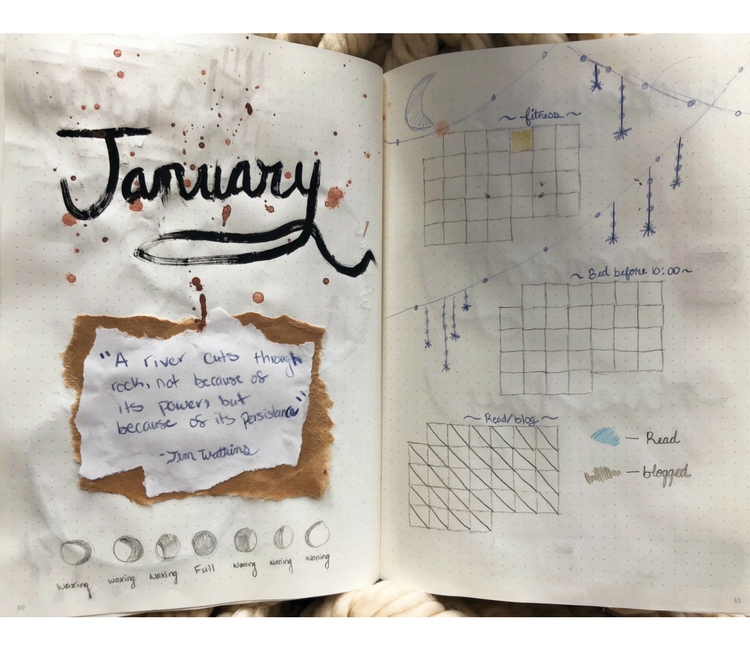 I received a black leather Leuchtturm journal for Christmas from my wonderful mother (S C R E A M I N G), I'm currently on break so I have time to devote to my journal (WHOOP WHOOP), and bullet journals have recently become... a little less scary. So without further ado... let's get into my bullet journal for 2018! 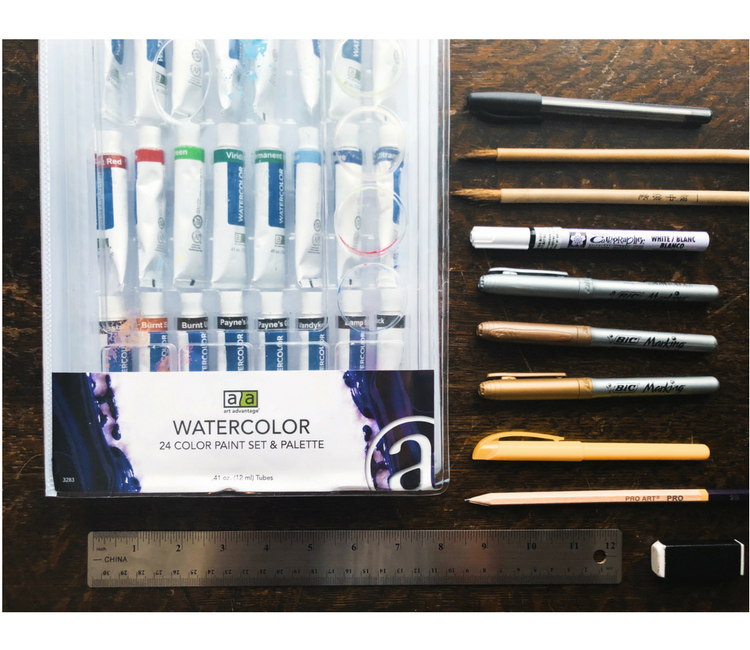 Before we get into things I thought I would show y'all the tools I've been using! The highlighters, sharpies, ruler, and BIC pens are all from Target. The a/a Watercolor paint is MY FAVORITE. I got it from Hobby Lobby and it's super easy to work with. There's a variety of different colors and it's been super helpful with making my bujo look not terrible xD. The PRO ART pencil came in a set along with the eraser. (These were a gift so I'm not quite sure where they came from). The calligraphy pen is linked later in the post but it's also been super helpful! Last but not least, the bamboo calligraphy brushes came from Hobby Lobby. This spread is the very first page of my bujo. I'm not sure if I want to add anything before this page but I've left plenty of space before it just in case I do. I've also left space for my table of contents, just in case it gets filled up. ANYWAYS for right now this is my 2018 intro page. 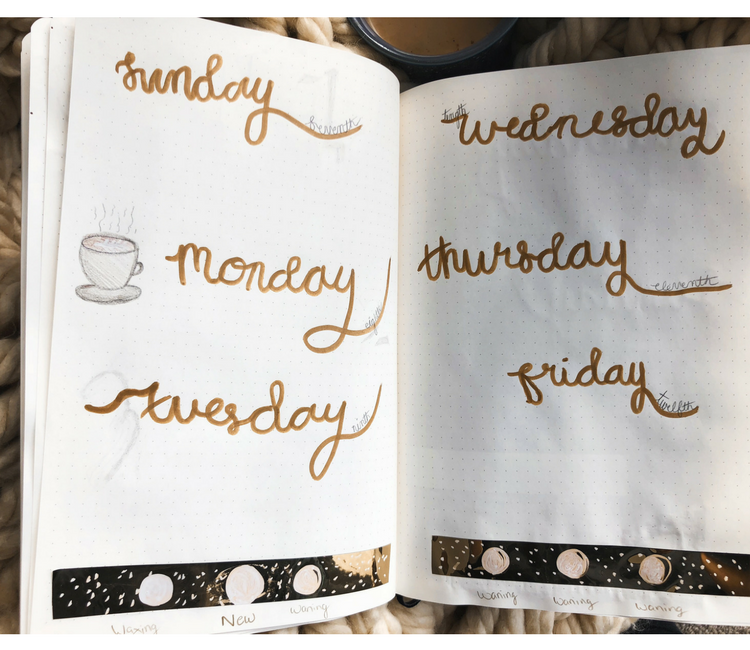 The calendar on the left was completely free-hand but if you're wanting to do something similar you can always print it out and do the the lettering yourself :) If you are wanting to do a similar calendar free hand then I H I G H L Y recommend drawing lines and boxes so it looks somewhat clean. I'm not great at free-hand so you can tell where it got messy xD The yellow highlighted dates are all the national holiday's + my mom and I's birthday's (ya know all the important holiday's haha). The print on the right is a watercolor I did based off of one I saw on Pinterest. 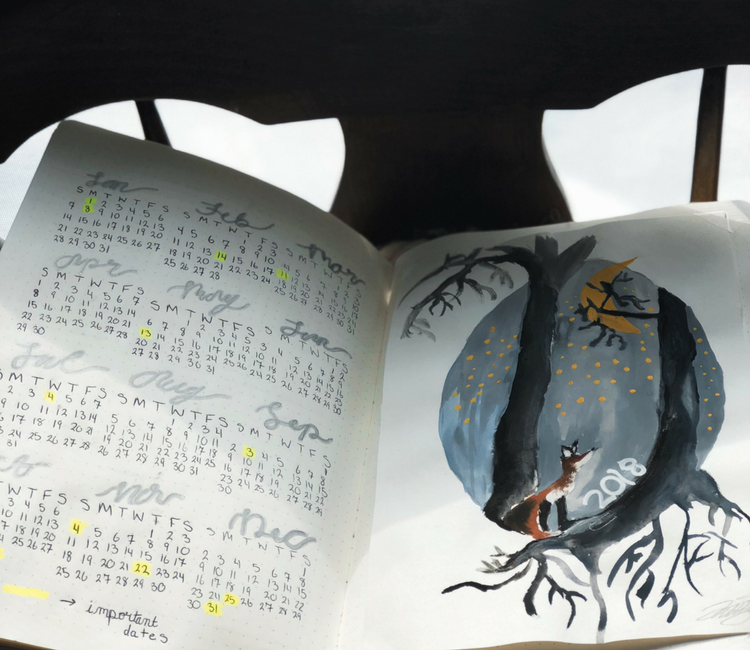 I wanted my theme for this journal to be something along the lines of "Forest of Lanterns" (yes I'm obsessed with the title "Forest of a Thousand Lanterns") or "magical nights" but I kind of diverted from said theme (as you'll see later on xD). I'm pretty proud of this page since it's not wholly based off of someone else's bujo LeT mE LiVE. I got the inspiration for the goal circle's from Pinterest but I decided to put my own twist on them. I painted them with watercolor so they look like coffee stains. 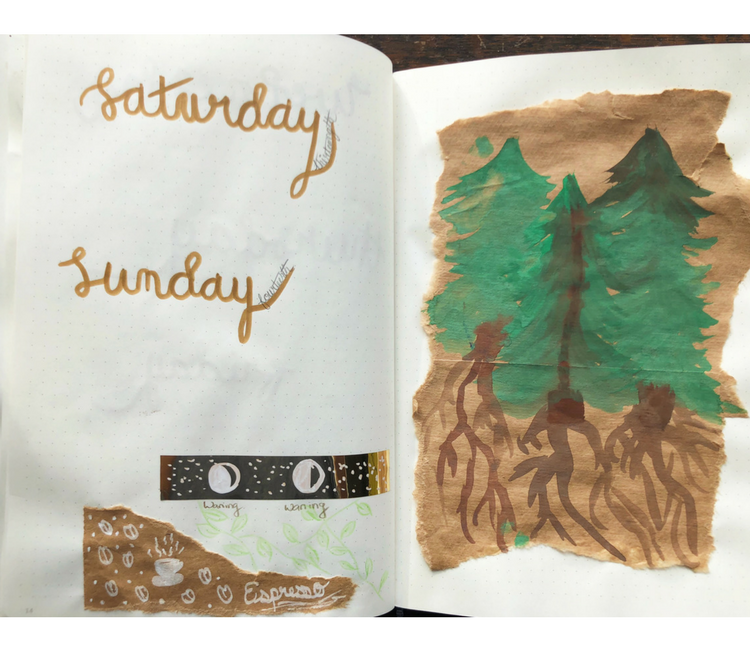 I messed up a little with the title in the corner so I just added a crap-ton more paint so it looks like my journal was a victim of the coffee apocalypse. This page is probably my absolute favorite in the my bujo so far! The right side is heavily based off of a video I saw from ChristineMyLinh on Youtube. She's honestly so inspirational and if you're lacking inspiration then I highly recommend watching her videos! I googled "inspirational quotes" (as one as sophisticated as I does) and I found this quote that I fell IN LOVE with. It's just a little bit of inspiration to get me to keep persisting. 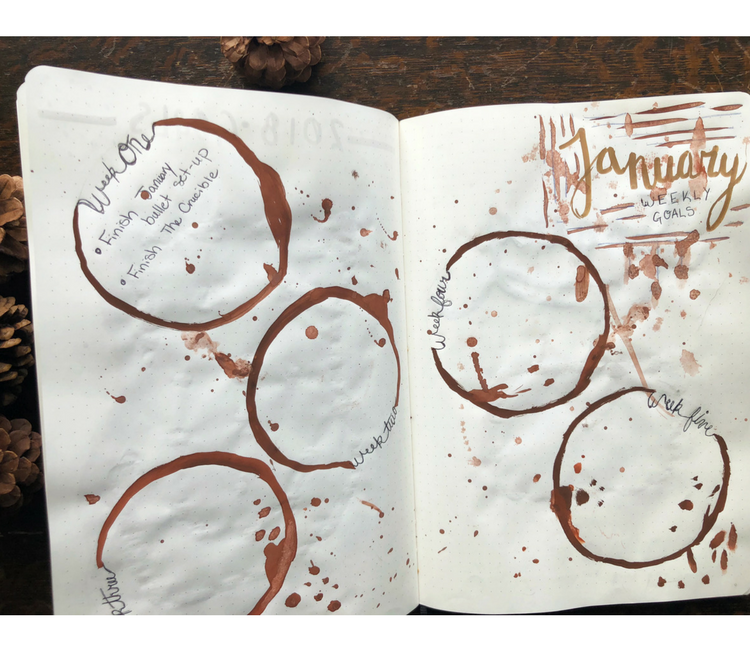 I felt like the page looked a little plain so I added more "coffee splatters" where the January is. I also added the phases of the moon at the bottom for aesthetic purposes. The right side is my goal tracker! I'll color in the top calendar when I do any type of workout (I could exercise 5 minutes or 2 hours but I'll still fill in the box the same amount). I have a tendency to stay up super late so I'll fill in a box on the middle calendar whenever I go to bed before 10:00. It hasn't happened yet if you were wondering xD. 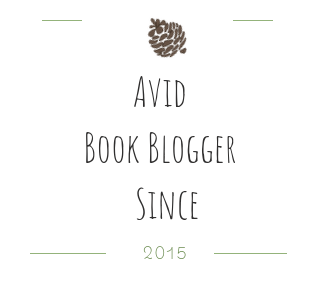 I'll fill in the bottom calendar whenever I read or blog. ... aaaaand I messed up on this page. I'm trying to decide if I want to add more "coffee splatters" on this page but ~we shall see~. This setup allows me to just list my tasks for the day (I already have a planner wholly dedicated to school so I don't need a ton of space). Towards the bottom we once again have the phases of the moon (these are the actual phases of the moon on these specific days of the week). I used a gold shiny washy tape to add some pizzazz and my White Calligrapher pen marker from the brand "Sakura" was used to draw the moons. This final spread is just a continuation of the last one. It has the days and the phases of the moon. The watercolor on the painting is a little... quirky but I love it anyways ahaha. I added little doodles towards the bottom for fun as well. 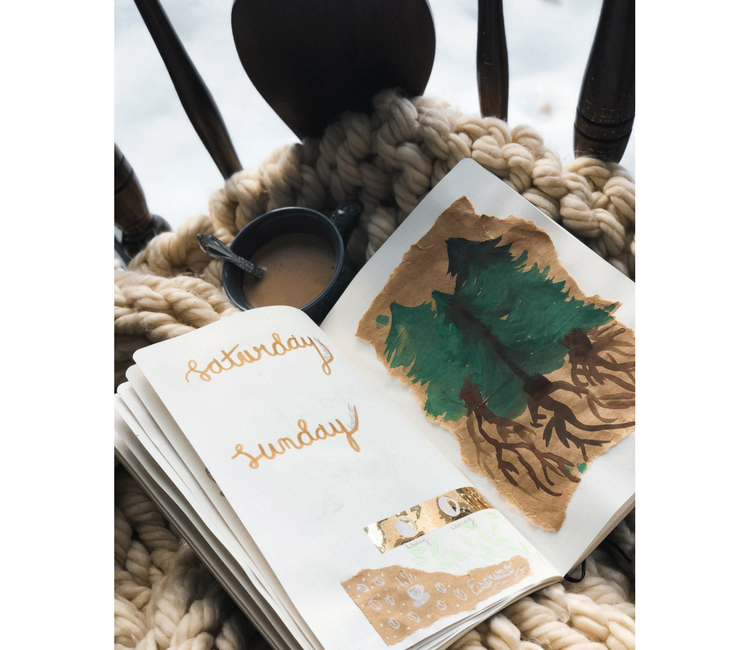 I'll continue to add pages as the month goes on and I'll probably be updating the journal this next weekend since the fourteenth is where I stopped. This is my second time attempting a bullet journal so I feel like I have a little bit of knowledge to pass on. (But definitely don't take my words as gospel since I'm still a newbie xD). What works for me might not work for you. 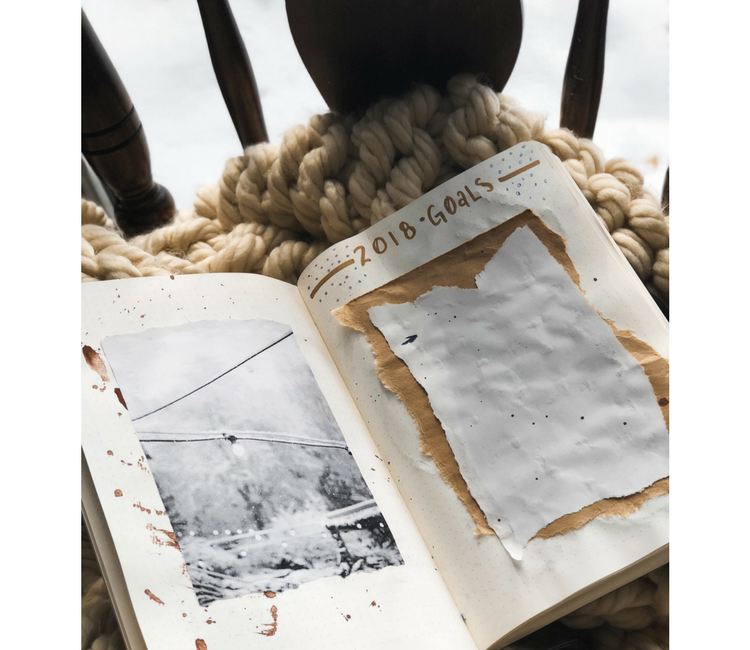 I started a bullet journal about two years ago when I saw Xan from Twirling Pages killing the bujo game. I set my bujo up exactly how how she set it up in her post but it just didn't work as well for me as it seemed to work for her. Since then I've learned that I'm not good with complicated set-up's. I'm not someone who enjoys filling in every detail of my life in my journal. The color-coding and complicated symbol system is not something I can personally sustain. But that doesn't mean you can't! 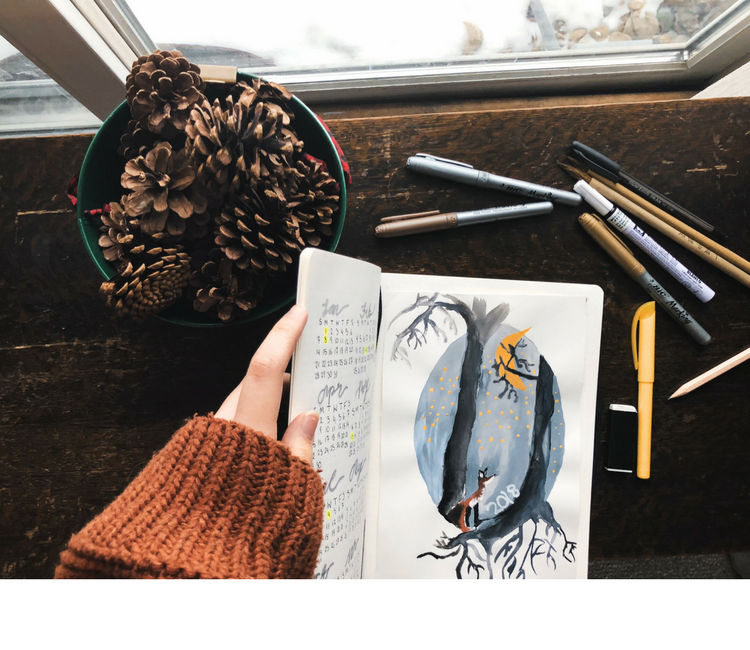 It all depends on what you want in your journal and how you see fit to organize it. The moment you make bullet journaling a chore it will stop being fun. This honestly goes for most things in life. If you really just don't feel like filling in your journal one day IT'S O K A Y. It's not the end of the world. 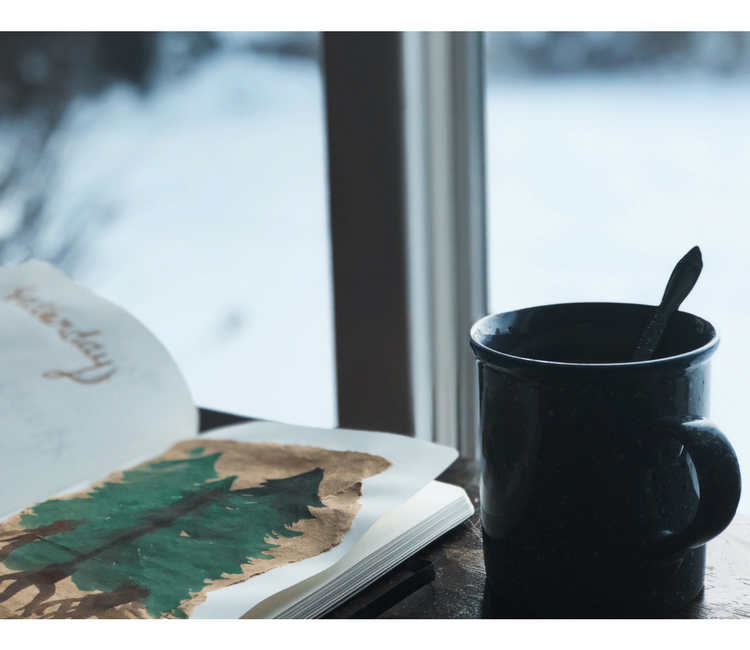 Bullet journaling should be something you enjoy doing, not something you feel is the equivalent of doing a long, boring, school assignment. Get creative! 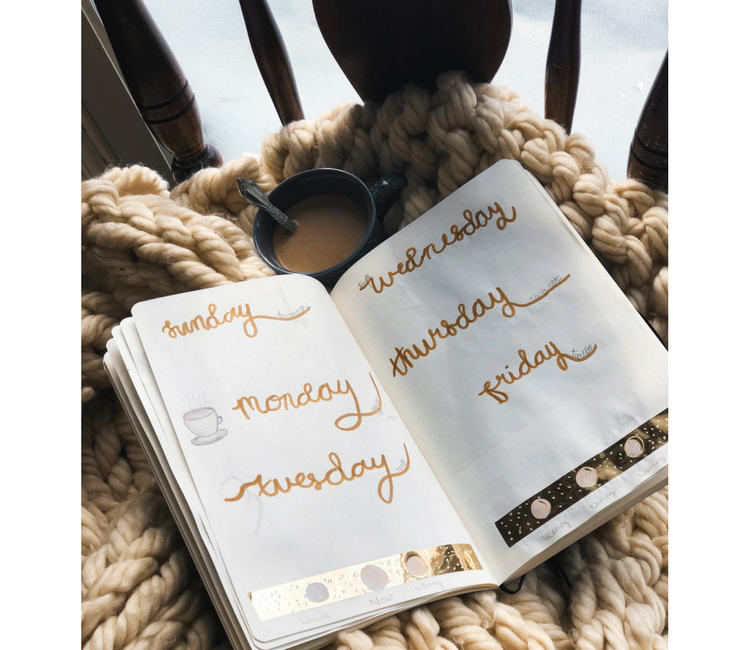 You don't need to be Picasso in order to make your bullet journal look cool. (I'm clearly no Picasso). If you're not great w/ free-handing anything then you can always print stuff out. Taking inspiration from others is a HUGE help when you're just starting out. I think that's about all for my bullet journal set-up/January plan/bujo tips at the moment. I hope that you've found this post helpful or maybe even *GASP* inspirational. (I search watercolor inspiration on an individual basis based off what I want to do). 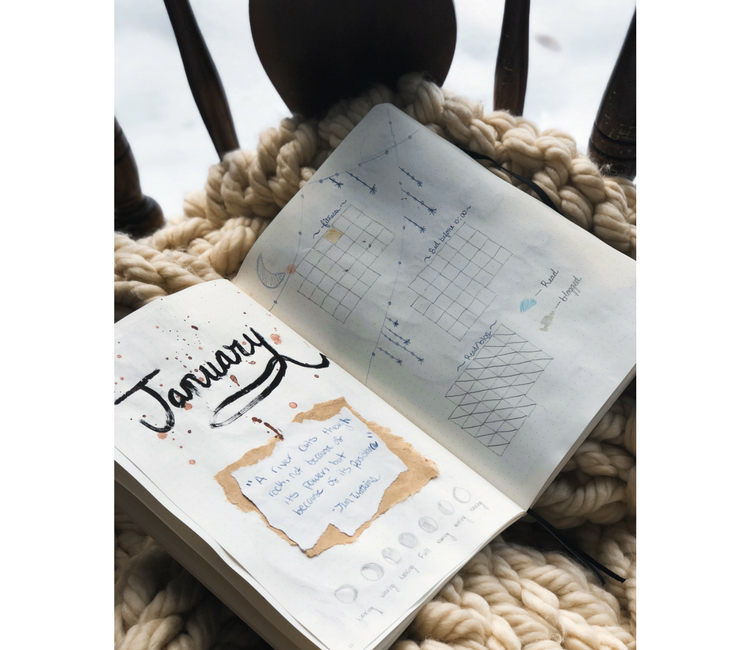 Are you bullet-journaling this year? If you're not, do you want to start?